We are a leading Manufacturer of frp pultruded profiles and frp ducts from Mumbai, India. 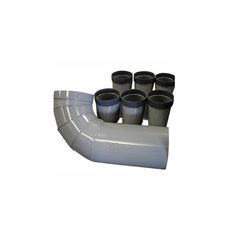 FRP Ducts offered by us are appreciated for features such as corrosion resistant, long lasting, leak proof and low maintenance. Tested for leakage, these ducts offer long service life and effective functioning. These ducts are light in weight and have superior acoustical qualities making them compatible and versatile for the different industry.